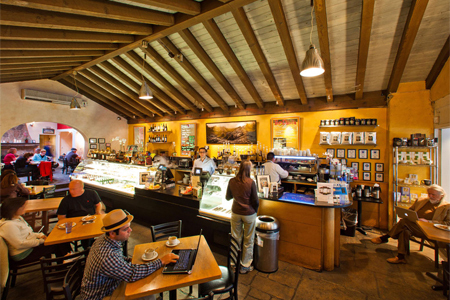 Coupa cafe is a restaurant where, over the years, Apple's Steve Jobs, Facebook's Mark Zuckerberg and Google's Sergey Brin have been seen. The cafe is in Palo Alto, California. Palo Alto is at the heart of Silicon Valley, home to some of the world's largest technology companies and some of the smallest startups. Coupa cafe is where many people buy coffee and make business plans. The owner of the cafe is Jean Paul Coupal. He started the cafe with his mother and his sister in 2004. The Coupa logo was seen on a cup in the 2010 movie The Social Network, about Facebook founder Mark Zuckerberg. The cafe serves Venezuelan coffee and a few Venezuelan dishes. Because the cafe is in Silicon Valley, it has tried some of the latest inventions in technology. In 2013, Coupa cafe started accepting Bitcoins, a digital payment system outside of traditional banks. "We want to be part of the technology," Coupal said. The cafe is also a place for people to hold meetings. "I remember seeing Mark Zuckerberg sitting here and having meetings," said Eric Sokol, an associate professor of obstetrics and gynecology at Stanford University. Sokol said he had many professional opportunities come about at Coupa cafe. Sometimes other people would overhear a conversation he was having. Currently he is an advisor to a health care related startup and a new investment fund. Both opportunities came when he was at the cafe. Because the cafe lets customers stay all day, many people do work there. "A lot of the startups in the area come and they like to work at Coupa, coding all day," Coupal said. "We've seen a lot of products that got developed at Coupa." The cafe also attracts students from colleges nearby like Stanford University. Katie Kennedy is a student from a local community college. She said she knew that opportunities could come from chance encounters at the cafe. Currently there are eight Coupa cafes. All were hand painted by Coupal's mother and sister. "The food's good, the coffee's good," Sokol said. "It just has the right atmosphere, the right mix of people. It's got an energy about it, I guess." Last month, I took a course at the community college on computers. PayPal is already involved in the digital payment space. My working days were spent mooning round his department, trying to sneak a chance encounter. 1.Coupa cafe is a restaurant where, over the years, Apple's Steve Jobs, Facebook's Mark Zuckerberg and Google's Sergey Brin have been seen. My feelings towards Susan have changed over the years. Over the years, Yul and Kirk had crossed paths many times. 2.In 2013, Coupa cafe started accepting Bitcoins, a digital payment system outside of traditional banks. Hedge funds take on traditional bank functions with a fraction of the employees. Traditional banks are also seeking to harness technology by rolling out mobile and tablet platforms.